PGQL is an SQL-like query language for the property graph data model and is based on the paradigm of graph pattern matching, allowing you to specify patterns that are then matched against vertices and edges in a graph. Like SQL, PGQL has support for grouping (GROUP BY), aggregation (e.g. MIN, MAX, AVG, SUM), sorting (ORDER BY) and many other familiar constructs. In addition, PGQL has regular path expressions for applications such as reachability analysis. 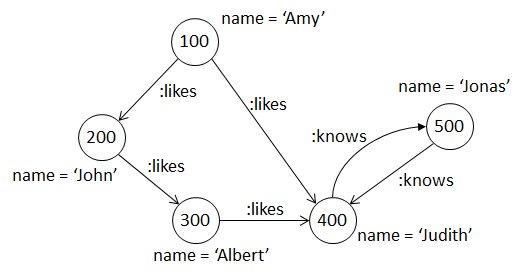 Input graph definition through FROM clause (see Input Graph (FROM)). Matching of edges in either incoming or outgoing direction through undirected query edges (see Undirected Query Edges). Quantifiers for specifying minimal and maximal number of applications in regular path expressions (see Min and Max Quantifiers). DISTINCT in aggregations (see Aggregation). SELECT DISTINCT (see Projections (SELECT)). Note: Oracle Spatial and Graph, Oracle Big Data Spatial and Graph, and Parallel Graph AnalytiX (PGX) maintain backwards compatibility by accepting PGQL 1.0 and PGQL 1.1 queries interchangeably. 'PATH' IDENTIFIER 'AS' PathPattern WhereClause? The symbol := has changed into the keyword AS. The inlined expressions (WITH construct) are moved to an optional WHERE clause. Double-quoted string literals are no longer allowed; string literals should be single-quoted. The constructs --> (match any outgoing edge) and <-- (match any incoming edge) are no longer allowed. Instead, use -> and <-. The infix Java RegExp operator =~ has been removed. Instead, use the built-in function java_regexp_like (see Built-in Functions). The ! (logical not) operator has been removed. Instead, use NOT (logical not). The != (not equals) operator has been removed. Instead, use <> (not equals). The ASC(x) (sort in ascending order) and DESC(x) (sort in descending order) functions have been removed. Instead, use the x ASC and x DESC constructs. Direct sorting of vertices and edges (e.g. ORDER BY v1, e1) is no longer allowed. Instead, sort using properties of vertices and edges (e.g. ORDER BY v1.propX, e1.propY). PGQL (Property Graph Query Language) is a query language for the property graph data model. This specification defines the syntax and semantics of PGQL. Essentially, PGQL is a graph pattern-matching query language. A PGQL query describes a graph pattern consisting of vertices and edges. When the query is evaluated against a property graph, all the possible subgraphs that match the pattern are returned. In the MATCH clause, the above query defines the pattern to be found. The pattern has three vertices, n, m and o, and two edges, e1 and e2. The edge e1 goes from n to m and the edge e2 goes from o to m.
Vertices n and m have a label Person, while vertex o has a label Car. Edges e1 and e2 have labels friend_of and belongs_to respectively. Vertex n has a property name with the value John. For each of the matched subgraphs, we project the property name of vertex m and the property name of vertex o. A set of vertices (or nodes). Each vertex has zero or more labels. Each vertex has zero or more properties, which are arbitrary key-value pairs. Each edge has a source and a destination vertex. Each edge has zero or more labels. Each edge has zero or more properties, which are arbitrary key-value pairs. Labels as well as property names are strings. Property values are scalars such as numbers, strings or booleans. Note: the property graph model in PGQL 1.1 does not support multi-valued properties like in TinkerPop. The SelectClause defines the data entities that are returned in the result. The MatchClause defines the graph pattern that is matched against the data graph instance. The WhereClause defines the filters. The detailed syntax and semantic of each clause are explained in following sections. The input graph is implicit because the system only handles single graphs. The system has a notion of a “default graph” like in certain SPARQL systems. The system provides an API such as Graph.queryPgql(..), such that it is already clear from the context what the input graph is. Subqueries may have their own FROM clause (see Querying Multiple Graphs). Subqueries may also omit the FROM clause (see Subqueries without FROM Clause). In a PGQL query, the MATCH clause defines the graph pattern to be matched. A path pattern that describes a partial topology of the subgraph pattern. In other words, a topology constraint describes some connectivity relationships between vertices and edges in the pattern, whereas the whole topology of the pattern is described with one or multiple topology constraints. The above example defines two vertices (with variable names n and m), and an edge (with variable name e) between them. Also the edge is directed such that the edge e is an outgoing edge from vertex n.
More specifically, a vertex term is written as a variable name inside a pair of parenthesis (). An edge term is written as a variable name inside a square bracket  with two dashes and an inequality symbol attached to it – which makes it look like an arrow drawn in ASCII art. An edge term is always connected with two vertex terms as for the source and destination vertex of the edge; the source vertex is located at the tail of the ASCII arrow and the destination at the head of the ASCII arrow. There can be multiple path patterns in the MATCH clause of a PGQL query. Semantically, all constraints are conjunctive – that is, each matched result should satisfy every constraint in the MATCH clause. Here, the vertex term (n) in the first constraint indeed refers to the same vertex as the vertex term (n) in the second constraint. It is an error, however, if two edge terms have the same variable name, or, if the same variable name is assigned to an edge term as well as to a vertex term in a single query. There are various ways in which a particular graph pattern can be specified. Please mind the edge directions in the above query – vertex n2 is a common outgoing neighbor of both vertex n1 and vertex n3. Third, it is allowed to ommitg variable names if the particular vertex or edge does not need to be referenced in any of the other clauses (e.g. SELECT or ORDER BY). When the variable name is omitted, the vertex or edge is an “anonymous” vertex or edge. Syntactically, for vertices, this result in an empty pair of parenthesis. In case of edges, the whole square bracket is omitted in addition to the variable name. The following table summarizes these short cuts. Here, vertices n2 and m2 are not connected to vertices n1 and m1, resulting in a Cartesian product. In the property graph model, vertices and edge may have labels, which are arbitrary (character) strings. Typically, labels are used to encode types of entities. For example, a graph may contain a set of vertices with the label Person, a set of vertices with the label Movie, and, a set of edges with the label likes. A label predicate specifies that a vertex or edge only matches if it has ony of the specified labels. The syntax for specifying a label predicate is through a (:) followed by one or more labels that are separate by a vertical bar (|). Here, we specify that vertices x and y have the label Person and that the edge e has the label likes or the label knows. has_label(element, string) returns true if the vertex or edge (first argument) has the specified label (second argument). labels(element) returns the set of labels of a vertex or edge in the case the vertex/edge has multiple labels. label(element) returns the label of a vertex or edge in the case the vertex/edge has only a single label. Here, the first filter describes that the vertex x has a property name and its value is John. Similarly, the second filter describes that the vertex y has a property age and its value is larger than 25. Here, in the filter, the dot (.) operator is used for property access. For the detailed syntax and semantic of expressions, see Value Expressions. There are two popular graph pattern matching semantics: graph homomorphism and graph isomorphism. The built-in semantic of PGQL is based on graph homomorphism, but patterns can still be matched in an isomorphic manner by specifying non-equality constraints between vertices and/or edges, or, by using the built-in function all_different(exp1, exp2, .., expN) (see Built-in Functions). Under graph homomorphism, multiple vertices (or edges) in the query pattern may match with the same vertex (or edge) in the data graph as long as all topology and value constraints of the different query vertices (or edges) are satisfied by the data vertex (or edge). Note that in case of the first result, both query vertex x and query vertex y are bound to the same data vertex 0. Under graph isomorphism, two distinct query vertices must not match with the same data vertex. Consider the example from above. Under graph isomorphism, only the second solution is a valid one since the first solution binds both query vertices x and y to the same data vertex. Undirected query edges match with both incoming and outgoing data edges. Note that in case there are both incoming and outgoing data edges between two data vertices, there will be separate result bindings for each of the edges. The above query will return all pairs of vertices n and m that are reachable via a multiple of two edges, each edge being either an incoming or an outgoing edge. In a PGQL query, the SELECT clause defines the data entities to be returned in the result. In other words, the select clause defines the columns of the result table. The following explains the syntactic structure of SELECT clause. ExpAsVar     ::= ValueExpression ( 'AS' VariableName )? An optional VariableName, specified by appending the keyword AS and the name of the variable. Per each matched subgraph, the query returns two vertices n and m and the value for property age of vertex n. Note that edge e is omitted from the result even though it is used for describing the pattern. The DISTINCT modifier allows for filtering out duplicate results. The operation applies to an entire result row, such that rows are only considered duplicates of each other if they contain the same set of values. It is possible to assign a variable name to any of the selection expression, by appending the keyword AS and a variable name. The variable name is used as the column name of the result set. In addition, the variable name can be later used in the ORDER BY clause. See the related section later in this document. SELECT * is a special SELECT clause. The semantic of SELECT * is to select all the variables in the graph pattern. SELECT * is not allowed when the graph pattern has zero variables. This is the case when all the vertices and edges in the pattern are anonymous (e.g. MATCH () -> (:Person)). Futhermore, SELECT * in combination with GROUP BY is not allowed. When there are multiple matched subgraph instances to a given query, in general, the ordering between those instances are not defined; the query execution engine can present the result in any order. Still, the user can specify the ordering between the answers in the result using ORDER BY clause. The following explains the syntactic structure of ORDER BY clause. OrderTerm     ::= ValueExpression ( 'ASC' | 'DESC' )? An optional ASC or DESC decoration to specify that ordering should be ascending or descending. If no keyword is given, the default is ascending order. It is possible that ORDER BY clause consists of multiple terms. In such a case, these terms are evaluated from left to right. That is, (n+1)th ordering term is used only for the tie-break rule for n-th ordering term. Note that each term can have different ascending or descending decorator. Numeric data values are ordered from small to large. Temporal data types (dates, time, timestamps) are ordered such that earlier points in time come before later points in time. Vertices and edges cannot be ordered. The LIMIT puts an upper bound on the number of solutions returned, whereas the OFFSET specifies the start of the first solution that should be returned. LimitOffsetClauses ::= 'LIMIT' LimitOffsetValue ( 'OFFSET' LimitOffsetValue )? | 'OFFSET' LimitOffsetValue ( 'LIMIT' LimitOffsetValue )? The LIMIT clause starts with the keyword LIMIT and is followed by an integer that defines the limit. Similarly, the OFFSET clause starts with the keyword OFFSET and is followed by an integer that defines the offset. Furthermore: The LIMIT and OFFSET clauses can be defined in either order. The limit and offset may not be negatives. The following semantics hold for the LIMIT and OFFSET clauses: The OFFSET clause is always applied first, even if the LIMIT clause is placed before the OFFSET clause inside the query. An OFFSET of zero has no effect and gives the same result as if the OFFSET clause was omitted. If the number of actual solutions after OFFSET is applied is greater than the limit, then at most the limit number of solutions will be returned. In the following query, the first 5 intermediate solutions are pruned from the result (i.e. OFFSET 5). The next 10 intermediate solutions are returned and become final solutions of the query (i.e. LIMIT 10). Path queries test for the existence of arbitrary-length paths between pairs of vertices, or, retrieve actual paths between pairs of vertices. PGQL 1.1 supports testing for path existence (“reachability testing”) only, while retrieval of actual paths between reachable pairs of vertices is planned for a future version. Here, we find all classes that are a subclass of 'ArrayList'. The regular path pattern subclass_of* matches a path consisting of zero or more edges with the label subclass_of. Because the pattern may match a path with zero edges, the two query vertices can be bound to the same data vertex if the data vertex satisfies the constraints specified in both source and destination vertices (i.e. the vertex has a label Class and a property name with a value ArrayList). Quantifiers in regular path expressions allow for specifying lower and upper limits on the number of times a pattern should match. Paths considered include those that repeat the same vertices and/or edges multiple times. This means that even cycles are considered. However, because the semantic is to test for the existence of paths between pairs of vertices, there is only at most one result per pair of vertices. Thus, even though an unbounded number of paths may exist between a pair of vertices (because of cycles), the result is always bounded. The following query finds all vertices y that can be reached from Amy by following zero or more likes edges. Note that here, Amy is returned since Amy connects to Amy by following zero likes edges. In other words, there exists an empty path for the vertex pair. For Judith, there exist two paths (100 -> 200 -> 300 -> 400 and 100 -> 400). However, Judith is still only returned once. The following query finds all people that can be reached from Amy by following one or more likes edges. This time, Amy is not returned since there does not exist a path that connects Amy to Amy that has a length greater than zero. Here, in addition to Jonas, Judith is returned since there exist paths from Judith back to Judith that has a length greater than zero. Examples of such paths are 400 -> 500 -> 400 and 400 -> 500 -> 400 -> 500 -> 400. The following query finds all people that can be reached from Judith by following zero or one knows edges. Here, Judith is returned since there exists the empty path that starts in 400 and ends in 400. Jonas is returned because of the following path that has length one: 400 -> 500. The following query finds all people that can be reached from Amy by following exactly two likes edges. Here, Albert is returned since there exists the following path that has likes edges only: 100 -> 200 -> 300. The following query finds all people that can be reached from Amy by following 2 or more likes edges. Here, Albert is returned since there exists the following path of length two: 100 -> 200 -> 300. Judith is returned since there exists a path of length three: 100 -> 200 -> 300 -> 400. The following query finds all people that can be reached from Amy by following between 1 and 2 likes edges. Here, John is returned since there exists a path of length one (i.e. 100 -> 200); Albert is returned since there exists a path of length two (i.e. 100 -> 200 -> 300); Judith is returned since there exists a path of length one (i.e. 100 -> 400). The following query finds all people that can be reached from Judith by following at most 2 knows edges. Here, Jonas is returned since there exists a path of length one (i.e. 400 -> 500). For Judith, there exists an empty path of length zero (i.e. 400) as well as a non-empty path of length two (i.e. 400 -> 500 -> 400). Yet, Judith is only returned once. One or more “common path expression” may be declared at the beginning of the query. These can be seen as macros that allow for expressing complex regular expressions. CommonPathExpression  ::= 'PATH' IDENTIFIER 'AS' PathPattern WhereClause? A path pattern declaration starts with the keyword PATH, followed by an expression name, the assignment operator AS, and a path pattern consisting of at least one vertex. The syntactic structure of the path pattern is the same as a path pattern in the MATCH clause. The above query finds common ancestors of Mario and Luigi. The above query outputs all generators that are connected to each other via one or more connectors that are all operational. GROUP BY allows for grouping of solutions and is typically used in combination with aggregation to aggregate over groups of solutions instead of over the total set of solutions. An optional variable definition that is specified by appending the keyword AS and the name of the variable. Matches are grouped by their values for n.first_name. For each group, the query selects n.first_name (i.e. the group key), the number of solutions in the group (i.e. COUNT(*)), and the average value of the property age for vertex n (i.e. AVG(n.age)). It is possible to assign a variable name to any of the group expression, by appending the keyword AS and a variable name. The variable name can be used in the SELECT to select a group key, or in the ORDER BY to order by a group key. See the related section later in this document. It is possible that the GROUP BY clause consists of multiple terms. In such a case, matches are grouped together only if they hold the same result for each of the group expressions. Matches will be grouped together only if they hold the same values for n.first_name and the same values for n.last_name. The group for which all the group keys are null is a valid group and takes part in further query processing. Group expressions that are variable accesses, property accesses, or built-in function calls may be repeated in select or order expressions. This is a short-cut that allows you to neglect introducing new variables for simple expressions. Here, the group expression n.age is repeated as select and order expressions. Aggregates COUNT, MIN, MAX, AVG and SUM can aggregate over groups of solutions. Syntactically, an aggregation takes the form of aggregate followed by an optional DISTINCT modifier and a ValueExpression. The following table gives an overview of the different aggregates and their supported input types. If a GROUP BY is specified, aggregations are applied to each individual group of solutions. Here, we group people by their age and compute the average salary for each such a group. If no GROUP BY is specified, aggregations are applied to the entire set of solutions. Here, we aggregate over the entire set of vertices with label Person, to compute the average salary. The DISTINCT modifier specifies that duplicate values should be removed before performing aggregation. Here, we aggregate only over distinct m.age values. This query returns the names of people who have more than 10 friends. Value expressions are used in various parts of the language, for example, to filter solutions (WHERE and HAVING), to project out computed values (SELECT), or, to group by or order by computed values (GROUP BY and ORDER BY). A variable reference, being either a reference to a Vertex, an Edge, or, an ExpAsVar. A property access, which syntactically takes the form of a variable reference, followed by a dot (.) and the name of a property. A bind variable (see Bind Variables). An arithmetic, relational, or, logical expression (see Operators). A bracketed value expression, which syntactically takes the form of a value expression between rounded brackets. The brackets allow for controlling precedence. A function call (see Functions). The IS NULL and IS NOT NULL predicates (see IS NULL and IS NOT NULL). The EXISTS predicate (see Existential Subqueries (EXISTS)). *For precision and scale, see Implicit Type Conversion. To compare such time(stamp) with time zone values to other time(stamp) values (with or without time zone), values are first normalized to have the same time zone, before they are compared. Comparison with other operand type combinations, such as dates and timestamp, is not possible. However, it is possible to cast between e.g. dates and timestamps (see Explicit Type Conversion (CAST)). Operator precedences are shown in the following list, from the highest precedence to the lowest. An operator on a higher level (e.g. level 1) is evaluated before an operator on a lower level (e.g. level 2). The property graph data model does not allow properties with null value. Instead, missing or undefined data can be modeled through the absence of properties. A null value is generated when trying to access a property of a vertex or edge wile the property appears to be missing. Three-valued logic applies when null values appear in computation. Note that from the table it follows that null = null yields null and not true. To test whether a value exists or not, one can use the IS NULL and IS NOT NULL constructs. Here, we find all the vertices in the graph that have the property name and then return the property. DateLiteral                  ::= 'DATE' "'" <yyyy-MM-dd> "'"
TimeLiteral                  ::= 'TIME' "'" <HH:mm:ss> "'"
TimestampLiteral             ::= 'TIMESTAMP' "'" <yyyy-MM-dd HH:mm:ss> "'"
TimeWithTimeZoneLiteral      ::= 'TIME' "'" <HH:mm:ss+HH:MM> "'"
TimestampWithTimeZoneLiteral ::= 'TIMESTAMP' "'" <yyyy-MM-dd HH:mm:ss+HH:MM> "'"
Note that the numeric literals (integer and decimal) are unsigned. However, signed values can be generated by using the unary minus operator (-). In place of a literal, one may specify a bind variable (?). This allows for specifying parameterized queries. PGQL has a set of built-in functions (see Built-in Functions), and, provides language extension through user-defined functions (see User-Defined Functions). ArgumentList         ::= ( ValueExpression ( ',' ValueExpression )* )? A function call has an optional package name, a function name, and, zero or more arguments which are arbitrary value expressions. Function and package names are case-insensitive such that e.g. in_degree(..) is the same function as In_Degree(..) or IN_DEGREE(..). id(element) object returns an identifier for the vertex/edge, if one exists. has_label(element, string) boolean returns true if the vertex or edge (first argument) has the given label (second argument). labels(element) set<string> returns the labels of the vertex or edge in the case it has multiple labels. label(element) string returns the label of the vertex or edge in the case it has a single label. all_different(val1, val2, .., valn) boolean returns true if the values are all different, a function typically used for specifying isomorphic constraints (see Subgraph Isomorphism). in_degree(vertex) exact numeric returns the number of incoming neighbors. out_degree(vertex) exact numeric returns the number of outgoing neighbors. Here, in_degree(x) returns the number of incoming neighbors of x, whereas id(y) returns the identifier of the vertex y. If a UDF is registered that has the same name as a built-in function, then, upon function invocation, the UDF is invoked and not the built-in function. UDFs can thus override built-ins. Implicit type conversion is supported for numeric types (see Implicit Type Conversion). Other type conversions require explicit type conversion (see Explicit Type Conversion (CAST)). If both operands are exact numerics (e.g. integer or long), then the result is also an exact numeric with a scale that is at least as large as the scales of each operand. If one or both of the operands is approximate numeric (e.g. float, double), the result is an approximate numeric with a scale that is at least as large as the scales of each operand. The precision will also be at least as high as the precision of each operand. Explicit type conversion is supported through type “casting”. Note that the syntax of a data type is one or more identifiers separated by a space, allowing the encoding of data types such as STRING and TIME WITH TIME ZONE. In the table above, Y indicates that casting is supported, N indicates that casting is not supported, and M indicates that casting is supported only if the numeric value is within the precision bounds of the specified target type. PGQL has five temporal data types: DATE, TIME, TIMESTAMP, TIME WITH TIME ZONE and TIMESTAMP WITH TIME ZONE. For each of the data types, there exists a corresponding literal (see Literals). In PGQL 1.1, the supported operations on temporal values are limited to comparison (see Operators and Comparison of Temporal Values with Time Zones). Subqueries in PGQL 1.1 are limited to existential subqueries. EXISTS returns true/false depending on whether the subquery produces at least one result, given the bindings obtained in the current (outer) query. No additional binding of variables occurs. Here, vertices p and fof are passed from the outer query to the inner query. The EXISTS returns true if there is at least one has_friend edge between vertices p and fof. If the FROM clause is omitted from a subquery, then the graph to process the subquery against, is the same graph as used for the outer query. Through subqueries, PGQL allows for comparing data from different graphs. Above, we compare two string properties from different graphs. Besides properties, it is also possible to compare vertices and edges from different graphs. However, because PGQL 1.1 does not have concepts like graph views, base graphs, or sharing of vertices/edges between graphs, such comparisons will always yield false. SINGLE_QUOTED_STRING ::= "'" ( ~[\'\n\\] | ESCAPED_CHARACTER )* "'"
Identifiers (used for e.g. graph names, property names, etc.) take the form of an alphabetic character followed by zero or more alphanumeric or underscore (i.e. _) characters. Not single quote characters, new line characters, or backslash characters. Unsigned integers consist of one or more digits. Unsigned decimals consist of zero or more digits followed by a dot (.) and one or more digits, or, one or more digits followed by only a dot (.). Escaping in string literals is necessary to support having white space, quotation marks and the backslash character as a part of the literal value. The following explains the syntax of an escaped character. Note that an escaped character is either a tab (\t), a line feed (\n), a carriage return (\r), a single (\') or double quote (\"), or a backslash (\\). Corresponding Unicode code points are shown in the table below. The following is a list of keywords in PGQL. Keywords are case-insensitive and variations such as SELECT, Select and sELeCt can be used interchangeably. Keywords are reserved names such that an IDENTIFIER (e.g. variable name or property name) may not correspond to one of the keywords.